Become A Therapy Dog - Your dog may have what it takes to help others? Almost any dog can become a therapy dog. Therapy Dogs are dogs that are trained to provide affection and comfort to people suffering from a wide variety of mental and physical problems. They visit hospitals, retirement homes, nursing homes, schools and non-profit gatherings. They also assist people with learning difficulties and stressful situations such as disaster areas. Therapy dogs come in all sizes, shapes and breeds. Temperament is the most important characteristic for a therapy dog. The perfect dogs for this kind of work must be calm, friendly, patient, confident and at ease in any situation. They must also enjoy human contact and be content to be petted and handled. To become a therapy dog it must freely allow children and adults to give hugs and kisses. Furthermore they need to allow some pulling on their hair, legs, ears and tail. Adults usually enjoy simply petting the dog. 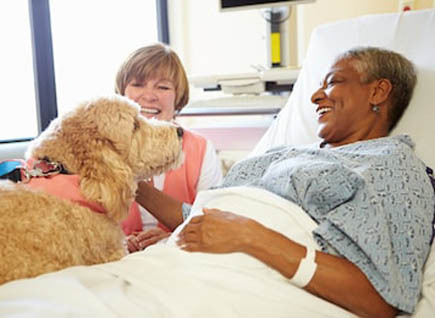 Therefore the dog should be comfortable being on a patient’s lap or bed, then sit or lie there comfortably. Therapy dogs are not classified as service or assistance dogs under the law. Service or assistance dogs directly assist humans. For this reason they have a legal right to accompany their owners into most areas and public buildings. In the United States, service dogs are legally protected at the federal level by the Americans with Disabilities Act of 1990. Therapy dogs do not provide direct assistance so they are not mentioned in the Americans with Disabilities Act. Institutions have the choice to either invite, limit, or prohibit access to therapy dogs. If they allowed, many institutions have rigorous requirements for therapy dogs. Many organizations provide testing and accreditation classes. Contact your local shelter or rescur group if you decide that you want to have your dog tested. First your dog must pass the equivalent of the American Kennel Club’s Canine Good Citizen test. After passing the CGC test they add further requirements specific to the environments in which your dog will be working. Typical tests might ensure that a dog can handle sudden loud or strange noises. It may test to make sure it can walk on assorted unfamiliar surfaces comfortably. They also test to make sure the dog is not frightened by people with canes, wheelchairs, or unusual styles of walking or moving. Further testing includes making sure your dog gets along well with children and with the elderly, and so on. Finally, If you need help teaching your dog any behavior you can contact us and we can give personal instruction. Contact Us.